Cost effective and time saving. Expenses such as labour and time will be significantly reduced due to the quick and easy installation process of ESM-B® boxes. ESM-B® boxes are the safest and foremost fire preventive outlet enclosures, the entire enclosure always satisfies or exceeds the electrical industries flammability requirements. Truly a weatherproof “Raintight” solution that creates the perfect seal which prevents water from entering the enclosure which could initiate an electrical fire. Our products are always in compliance with the strictest electrical code, avoid using illegal enclosures and stop wasting time by switching to ESM-B®. 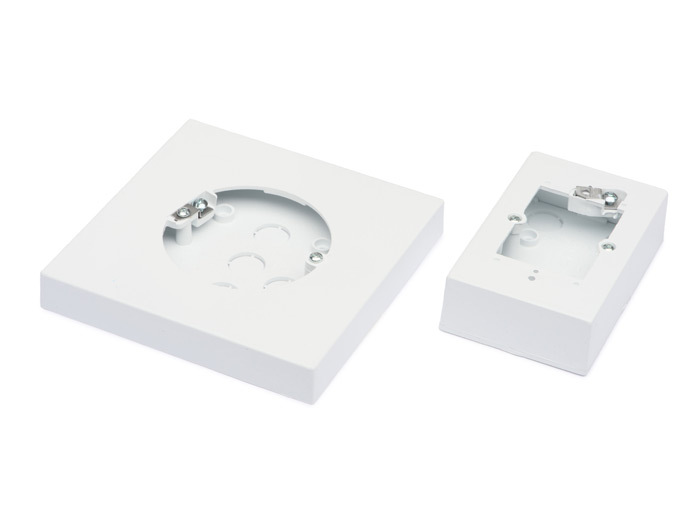 These boxes feature a grounded surface on which the wiring device or light fixture is seated, making them the most incomparable electrical outlet box available in the industry. Simple one piece installation with absolutely nothing to disassemble or reassemble. Does away with all the extra labor and costs associated with basic outlet boxes. ESM-B® outlet boxes are aesthetically pleasing and look exceptional with all forms of architecture from traditional to modern. These boxes have a timeless and simple shape that never goes out of style. Paintable. The boxes can easily be painted in order to accommodate any customized colour you may require for your installation. ESM-B® products are manufactured with UV-resistant plastic which is tough and durable and can endure a lifetime of exposure to even the harshest environmental elements. Simple and easy to remove during renovations without causing damage to exterior finishes. Provides a finished surface to place fixtures or devices. Quite often basic electrical outlet enclosures hidden behind an outdoor wall mounted receptacle or light fixture, do not always comply with the electrical code. Part of the reason being that when wall material is part of an electrical assembly it generally results in a sub-par installation or potential illegal enclosure. This is a frequent occurrence when the wall finish is siding. Many siding installers seat extension covers or mounting blocks on the siding to mount electrical devices such as fixtures or plugs, etc. This can create a myriad of problems due to these siding products not always being electrically rated which usually results in a sub-par installation or worse could result in an illegal enclosure. In addition to siding wall opening covers and/or mounting blocks generally being aesthetically unpleasing and resulting in a poor finish, most of these products lack electrical certification making them more susceptible to fire in the event of an electrical fault. Siding covers and mounting block installations are also much more costly in terms of labour and material expenses as opposed to the simple one step solution of ESM-B® products. 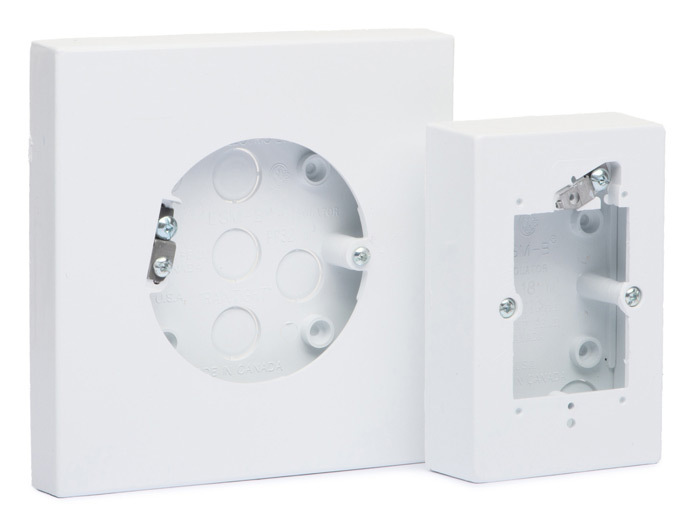 With ESM-B® boxes, siding wall opening covers which previously added a sub-par and a potentially illegal aspect to the outlet enclosure are no longer required and therefore are history. Furthermore when ESM-B® boxes are installed on siding, the trim of the siding seals around the “Stumm Box™” in the comparable way that it seals around doors and window frames on the building. This compliments the visual appearance of the property by providing a seamless and professional finish. In some modern panel siding installations ESM-B® boxes can themselves be clad in the material to create a harmonious finish. Please see our gallery for installation examples. Stumm Boxes™ can further be used to create a 100% safe enclosure on virtually any other type of structural finish such as concrete, tile, wood and more. When using ESM-B® “Stumm Boxes™” on stucco, the weatherproof receptacles are never embedded. If they ever need to be removed, the stucco will not be damaged if the box is removed using caution. Due to basic electrical boxes being embedded in the stucco, if the box is ever required to be removed, significant damage can occur to the stucco. ESM-B® boxes however are unquestionably effortless to remove post-installation, which makes them optimal for renovations. ESM-B® boxes are again the obvious choice for Masonry applications, such as rough or uneven stone work etc. When “Stumm Boxes™” are used water cannot enter into the electrical outlet enclosure, therefore preventing electrical fires. However when basic boxes are used, water can easily enter the enclosure unless extra labor is expended to caulk and prevent water from entering. ESM-B® boxes also create a fine and distinguished finish on Masonry applications. 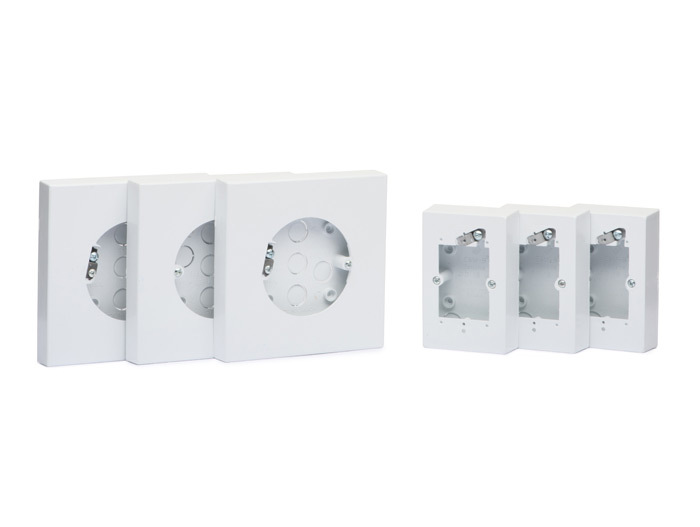 ESM-B® “Stumm Boxes™” are by far the top choice for high-quality installations in all applications. Our versatile boxes are convenient, cost effective, time saving and will produce a 100% safe enclosure that is built to last. Please see the “Where To Buy” tab for more information on purchasing our products. If you have further questions about our products please don’t hesitate to call or e-mail us, please visit the “Contact Us” page for more details.